This article is designed to illustrate the deceptive recruiting techniques used by members of the independent sales force of Mary Kay. How many of these buzz words and catch phrases did you hear when you were being recruited? We will go through a “typical” recruiting interview and point out the things that are either misleading or outright lies, using documents that are used by MK consultants. How do women get sucked into listening to the Mary Kay opportunity? The Pitch after a facial, skin care class, business debut etc. The Bribe- offering a gift or service. The practice interview is not for training purposes. It is designed to pitch the marketing plan to family and friends of new consultants hoping they will sign up. The interviewing process can be taught using the director or recruiters prospects. When women express an interest in moving up the MK career path they are told how many recruits are needed for the next level. The director challenge is a gimmick designed to push consultants into approaching women they know or are friendly with and asking them to “help” them. We, as women are usually eager to help our friends if we can. A well trained director/recruiter has been taught to “overcome objections.” They use the line “whether you think you would ever be interested in MK” counting on their ability to overcome the most common objections. How is the marketing plan presented? There are numerous versions of the marketing plan out there. Some MKers will use a full blown presentation with props and audience participation. Some have a slick little notebook with colorful pictures. Others simply use a sheet of paper with the information and questions printed out. However the presentation is made, the information given is about the same. In this phase the recruiter will ask questions about you. They are probing for information in order to learn what parts of the MK opportunity will appeal to you most. They want to know “what you need” also known as “finding her hot buttons.” Often recruiters will have a “quiz” with each question having four answers. The responses to these questions will tell the recruiter what type of personality the prospect has. From this point on an experienced recruiter will tailor the rest of the interview towards that personality type. For each personality type there is a list of aspects about the opportunity to be emphasized that will give the appearance of being tailor made for that personality. Other aspects of the opportunity are downplayed. Directors and consultants wanting to recruit are taught how to do this. What do you need most in your life right now? Where do you see yourself in 5 years? Doing the same thing? Will doing what you’re doing now get you where you want to be? What is the ideal business environment? PART TWO OF THE PITCH: All About Me!!! In this phase the recruiter will talk about why MK has been a great life changing experience for her. My highest monthly commission was $xxxx. Or here is a copy of my last commission check. I’ve made lots of friends through my Mary Kay career. A Busy Person – The idea is that a busy person knows how to get things done efficiently and can find a way to fit Mary Kay into her life. Unfortunately, this is a myth. Working this business takes a great deal of time. If a woman already feels like she has too little free time trying to add MK into her busy life will be a disaster. Doesn’t know a lot of people – This statement is absurd. 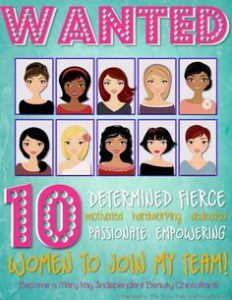 Once a woman becomes a consultant the first thing she will be advised to do is “make a list of 30 women you’d like for your first customers.” Another tip is “start with friends.” Other bits of wisdom are the “perfect start” (15 faces in 15 days), “power start” (30 faces in 30 days) and the “new business debut.” How is a woman who “doesn’t know a lot of people” going to accomplish any of those tasks? The answer is “she won’t” and will feel very discouraged right from the beginning. Not the “sales type” – The logic behind this is “we don’t want a pushy sales person, our job is to teach women how to take care of their skin.” Also heard on this topic is “we teach skin care, once women experience how great our products are they all want to buy them” or a variation of “the products sell themselves.” This is an outright lie. This is a sales job, period. If you do not have a “sales personality” it will be very difficult to succeed in this business. You can be a great teacher, and do a great job at skin care classes. That does not equal sales. Has more month than money – The need for cash is supposed to be a motivating factor to book classes, hold appointments, and all the other things required to “work the business.” This is in direct opposition to what is taught once the agreement is signed. More on this topic will be forthcoming. Family Oriented – This is another absurd statement. MKers spend a lot of time talking about how this opportunity has enhanced their family. They use lines like “I don’t use my children as an excuse. I see them as a reason to succeed.” To really work this business and be successful at it requires time, lots of time. No matter how you slice it, that is taking away from your family. Another tidbit not usually disclosed about family during recruitment is that children are not welcome at MK functions. A consultant will be encouraged to “hold an extra class each week” to be able to pay for a babysitter in order to attend the weekly success meetings. Decision maker – Recruiters love women who hear the spiel and are ready to sign on the spot. They refer to this as someone who is a “decision maker.” Are you going to hem and haw about every little decision? Will you need to consult with your husband about anything? Do you require time to research the opportunity, read the agreement, or weigh the pros and cons? Are you going to ask tough questions with pesky details about how the business works? Company Philosophy of God/Faith first, Family second, Career third – This lures a lot of women into the business. Unfortunately, this does not reflect what is practiced in reality. Scriptures are often used to manipulate women into making decisions that turn out to have devastating consequences. Phrases like “Have an abundance mentality” and “God wants us to have riches” warp what God of the bible teaches us. Women are discouraged from consulting their husbands regarding the decision to start an MK business with statements like “It’s easier to beg for forgiveness than to ask for permission.” Women are encouraged to deceive their husbands about inventory purchases and using credit cards. Consultants are encouraged to leave their children with babysitters several times per week in order to work their business, hold classes, and attend meetings and training. The higher up the career path one gets the worse these behaviors become. Golden Rule – “Do unto others” is a mantra often heard in MK circles. Flexibility/Be Your Own Boss – This sounds great to potential team members. Who wouldn’t want to set their own work schedule, or determine how to run their business? Once “training” begins new consultants quickly learn they are not their own boss after all. There is a “dress code” for all Mary Kay functions. There are rules for how and where one can advertise their own business. There are rules on how and where one can sell the product that are very limiting once the “tried and true” methods fail. There are a minimum number of active recruits needed to move up to and maintain a new career status. Once the car has been earned, there are monthly production requirements in order to keep the car. All levels of directorship have quotas of monthly production and active team members. 90% Buy Back Guarantee – This point is used to portray the opportunity as a “no risk” proposition. Things like “You have nothing to lose” and “The Company wouldn’t make that offer if this were not a legitimate business” will be heard. The deception here is subtle. Texas laws require Mary Kay to offer this option. It’s not because Mary Kay is so wonderful. This information is not usually disclosed by Mary Kay nor is it known to most of the independent sales force. Advance at Your Own Pace – Again, the deception in this statement is very subtle. A consultant advances only by adding new consultants to her team. In addition, the recruiter’s new status does not take place until the new team member has placed her initial wholesale order (minimum $200.00). Further, if the new team member does not maintain her active status, the recruiter is then “demoted.” In all fairness, however, each consultant makes the choice to recruit or not. Increase Confidence and Build Self Esteem – Many consultants make the claim that success in Mary Kay has caused an increase in self confidence and boosted self esteem. However, most consultants will have difficulty booking appointments, selling the product and finding new team members and will experience feelings that are quite the opposite. Training – “Training” in MK usually consists of listening to other women’s success stories. Tips to help consultants book appointments and interviews hold a skin care class, and package products are also shared. Tips for running a successful business are in short supply. Drive Free – This is perhaps the most blatantly false statement perpetuated by Mary Kay consultants and directors. A “free car” is not given to consultants who earn them. The company makes lease payments for the car on behalf of the consultant. Those payments are reported to the IRS as income at the end of each year and consultants are responsible for any tax liability on that income. In addition, the continued use of the car is dependent on the consultants’ team or unit monthly wholesale production. If the team or unit fails to meet the minimum required production the lease payment will be deducted from the consultants’ monthly commission checks or a bill will be sent. Further failure to meet production will result in the car being taken away from the consultant. Eat your heart out pinkies– MK is offering 2 FREE vitamin C “superpowers” if you start a Mary Kay debt.. I mean business.. start a MK business in February. I am not promoting MK I am being saracastic. You can look at their website. There is a “dress code” for all Mary Kay functions. That reminds me. I’m going to a training class halfway across the country in a few weeks. (Fully paid for by my employer, of course.) I double-checked with my boss yesterday, and nobody cares if I show up to class wearing my usual jeans, sneakers and jewel-neck tunics. Ah, the joys of working in IT. I’m also in IT and agree on the joys of nobody caring what you wear. I’m in the first 2 weeks of signing up and seriously regretting one of the few impulse decisions that I’ve made in my life. Luckily have only spent the initial $100 and pretty sure the train stops there!